Adam Law’s numbers should put him among the leaders in the A+ California League. His 11 for 29 (.379) and 6 rbi performance last week pushed his season average up to .322 over 146 at bats. But the strength of his numbers hasn’t put him on the leader board yet. He is about 2 weeks short of the number of plate appearances needed to qualify—mainly because he was injured and out of the line up for several weeks earlier in the season. But Law’s numbers are otherwise strong enough to place him among the top 10 batters in the California League. Watch here to see where he ends up once he qualifies. 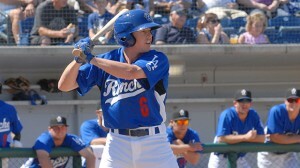 Law wasn’t the only Mormon in the minors who was hot at the plate last week. Jaycob Brugman continued to make his case in the Midwest League, where he was 9 for 23 (.391) with 4 rbis, 5 walks and a stolen base. Brugman does qualify for the leader board in his league, and appears there in OBP, SLG and OPS. 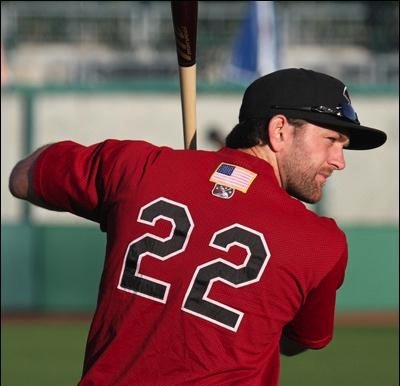 And in AAA the Sacramento River Cats’ Shane Peterson is also very strong, hitting .310 last week (9 for 29) with 5 rbis and a home run, bringing his season average up to .296. He is in the PCL’s top ten in runs scored, hits and walks. 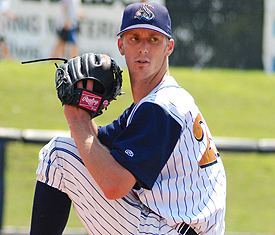 Returning from hip surgery, veteran pitcher Clayton Mortensen, who has spent parts of the last 5 seasons as a reliever in the majors, pitched two steller games last week. Over a total of 11 innings, Mortensen shut out his opponents while giving up just 6 hits and 3 walks and while striking out 10. He finished the week with a 1-0 record, a 0.00 era and a 0.82 WHIP. I’m sure he will be trying to keep up that level of play during the rest of the season. Mortensen wasn’t the only stellar Mormon pitcher in the minors. Taylor Cole (Dunedin Blue Jays of the Florida State League — A+) also shut out his opponents in a 7-inning start, giving up just 3 hits and no walks while striking out 9. He remains at the top of the league in strike outs (with 82) and 3rd in the league in WHIP. His numbers are so good that it seems likely the Blue Jays are just waiting for a spot in AA to open up. Where are the Mormons in Baseball?? We are a week away from the first Spring Training baseball games, and most players have already reported. And as always happens during the off-season, many players have moved from one team to another as managers search for just the right combination of players, and players look for more money or better opportunities. Of course, the Mormons in professional are no exception. Here is a rundown of the Mormons who played at least one game in the majors last year and where they are at the moment. Tomorrow I’ll give a rundown of those who only played in the minors last year. In the final minors playoff game this year, the Omaha Storm Chasers of the Pacific Coast League beat the Durham Bulls of the International League in the AAA Championship game. The Storm Chasers’ Mormon pitcher, Clayton Mortensen, didn’t pitch in that game, but did pitch in the first game the team played against the Salt Lake Bees, lasting 5 innings after a rainout the previous day delayed the game after 1 1/2 innings. 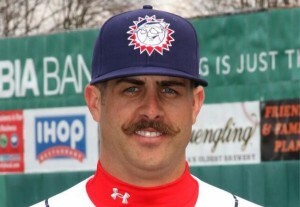 The minors post-season ended yesterday for all but one of the Mormons in the minor leagues. 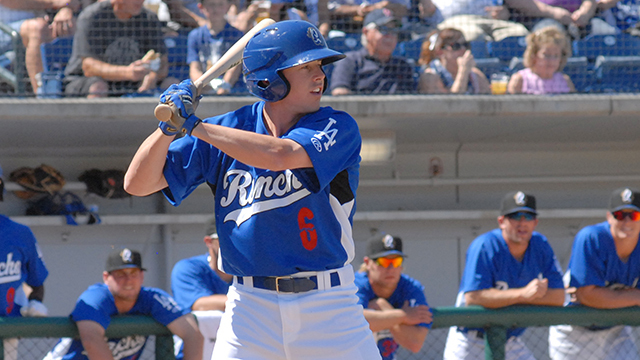 While in the International League championship Mitch Maier’s Pawtucket Red Sox lost their bid to force a 5th game in their contest with the Durham Bulls, Clayton Mortensen’s Omaha Storm Chasers won the 3rd of the 4 games they played against the Salt Lake Bees to secure the Pacific Coast League Championship. Neither Maier (on the DL) nor Christensen (pitched Wednesday) played in the games yesterday. 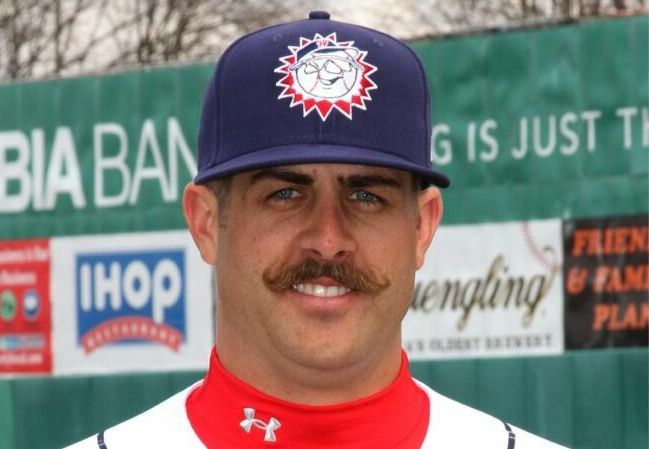 Although Bryan Harper didn’t play, the Hagerstown Suns were defeated Friday in the Southern Atlantic League Championship by the Savannah Sand Gnats. Harper pitched two shut-out innings in Thursday’s loss, and wasn’t called on to pitch in the final game. The loss leaves just two players in minor league championship series, Mitch Maier (on the DL — not expected to play) and Clayton Mortensen. Playoff games tend to have clutch moments. In a 3-game series every game is a clutch situation. And even up a game, the Hagerstown Suns must have felt it in a clutch when the 9th inning of the second ended in a tie. And then in the 11th, after Justin Thomas put on two base runners and got just one out, they called up Bryan Harper in the clutch situation. Unfortunately, Harper couldn’t stop the West Virginia Power from scoring. He gave up a double to Josh Bell, which scored the two runners left on base by Thomas, and then a single that scored Bell, before inducing a strike out that ended the inning. But the damage done was too much for the Suns to make up, and the Power tied the series at 1 game all. The Suns and Power play the deciding game tonight. Clayton Mortensen, who pitched in the Red Sox bull pen earlier this year, started for the Omaha Storm Chasers in their second post-season game and earned the win, despite a bad 4th inning in which he gave up 4 runs and nearly lost the game. The Storm Chasers had only scored twice before the bottom of the fourth, and Mortensen then struggled, giving up a single, followed by a walk, followed by an rbi single and then a 3-run home run, all before he managed to pull it together and get grounders to finish off the side. For another inning he faced the loss, but in the top of the 6th Omaha scored another 5 runs and the bull-pen shut down the Oklahoma Red Wings to give Mortensen a win. Still, it was an ugly one, as Mortensen ended up with a 7.20 era and 1.40 WHIP. He gave up a total of 5 hits, two walks while striking out 4.